We know it is challenging to constantly push yourself and set high standards but, in time, you will reap the benefits of this. A great chef is always pushing him/herself. Identify your weak areas and push yourself even harder in those areas. Your Mise En Place should be where your day starts and ends. Persistent planning and organisation will help you master your Mise En Place which will lead to service running smoothly and efficiently. Plan a routine of getting your Mise En Place sorted when you arrive and when you leave. Be early or be on time but never be late. There are so many things to be done before service. You don’t want to annoy the rest of the team by being late all the time and expecting them to do it all. It also shows you’re keen and dedicated if you’re early or on time for every shift. There will never be a time when there is nothing to be done in the kitchen. Empty the rubbish, wipe down counters, wash utensils, wipe down equipment – the list is endless. Show your commitment to the team by getting your hands dirty rather than catching up on Instagram. Get yourself some steel toe capped shoes. You’ll be surprised at the number of times you drop something heavy on your toes or spill boiling hot liquid. 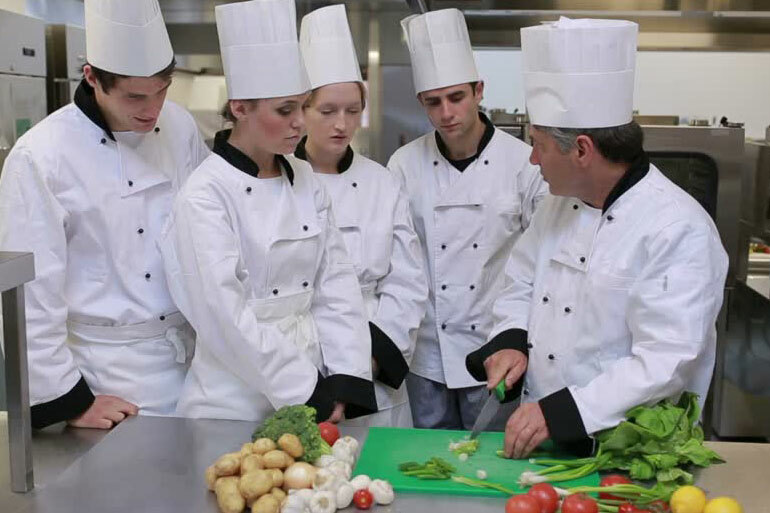 Pushing yourself, mastering your Mise En Place, arriving on time or early and keeping busy are all excellent skills to have in the kitchen and will certainly place you in favourable light when interviewing with a chef.